"These are to-die-for ribs you will want to serve to guests, to show off your cooking ability." Prepare charcoal in a smoker, and bring the temperature to 225 degrees F (110 degrees C). 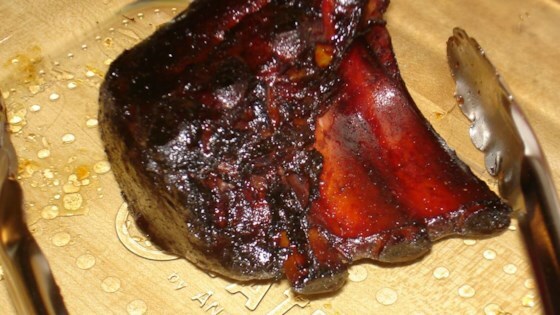 Cut the ribs into smaller portions of 3 or 4 ribs, and place them in a large pot. Pour in enough apple juice to cover. Place a lid on the pot and bring to a boil. Remove from the heat, and let stand for 15 minutes. Lightly oil the grate in your smoker. Place ribs on the grate, and throw a few cloves of garlic onto the hot coals. Close the smoker. Maintain the temperature at 225 degrees F (110 degrees C) by adding more charcoal as needed. Smoke the ribs for 7 hours, adding more garlic cloves to the coals occasionally. Make a sauce by mixing together the barbeque sauce with 2 cups of the apple juice from the pot. Season with granulated garlic. Baste ribs with this sauce while continuing to cook for another 30 minutes. Excellent! We finished the last 30 min. in a 350 degree oven wrapped in foil with the bbq sauce. This eliminates all that bbq sauce clean up in the smoker. Bill, this is a great recipe and you can cook for me anytime! Your ribs were fantastic, tender, loved and devoured by all!! ASAP!! Move over Arthur Bryant! Kudos to you, Bill.